Dynamics 365 for Marketing provides several ways to help you get to know your potential customers and to see how they interact with your various marketing initiatives. We've already mentioned that you can see when email recipients open a message or select a message link—and when new or existing contacts submit a form from a marketing page. You've also seen that these actions can affect lead scores and the way contacts flow through your customer journeys. How known contacts and anonymous visitors use your website. How known contacts and anonymous visitors select links you put in social posts, banner ads, and elsewhere. In this exercise, we'll look into how to set up website and click tracking. Go to Marketing > Internet Marketing > Websites. You now see a list of existing websites. Make sure you don't already have one set up for your site. On the command bar, select New. The New Website page opens. Enter a Name to identify the website (or partial website) that you want to track. A URL and Description might help other users but won't affect the script or its functionality. The Timeout setting enables closely grouped visits from a single browser to be recorded as a single session. A new session will start after this period of inactivity from a given browser. The default, 20 minutes, is usually a good value. 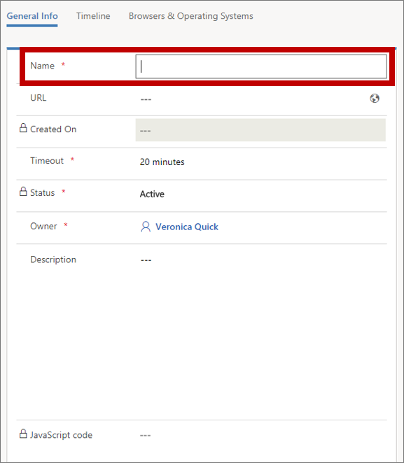 Dynamics 365 for Marketing can generate redirect URLs for you. 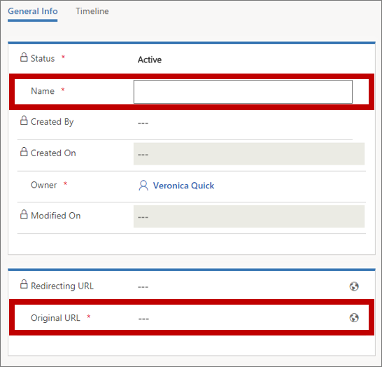 Each redirect URL targets your Dynamics 365 for Marketing server, which logs the click and then immediately redirects the user to the expected content. This enables you to log clicks on links that you put into social media posts, banner ads, forums, and elsewhere. This information can help you choose the best channels for getting your message out. These records are also mapped to specific contacts when possible (usually because they have submitted a marketing form and therefore have a cookie set in their browser). To compare the traffic you generate for different channels or campaigns, you should set up a unique redirect URL for each channel and/or campaign where you want to track link clicks. For example, use one redirect URL for links you put on Twitter, another one for Facebook, and another one for banner ads. Then you could see which of these channels produced the most clicks by comparing the related redirect URLs. Go to Marketing > Internet Marketing > Redirect URLs. You now see a list of existing redirect URLs. On the command bar, select New. The New Redirect URL page opens. Name: Enter an internal name for the redirect URL. If you use this feature often, you should come up with a naming convention that will make it easy to find the right record when you want to come back and view results, for example "Twitter spring campaign" or "LinkedIn banner". Original URL: Enter the full URL for the page the redirect URL will target. This is the page that users will actually be expecting when they select the link. On the command bar, select Save. The page is reloaded with an autogenerated link in the Redirecting URL field. Copy and use this version of the URL in your communications as needed. To see usage statistics about one of your redirect URLs, go to Marketing > Internet Marketing > Redirect URLs and open the link you want to learn about. The General info tab shows a map of where the clicks occurred, and the Timeline tab provides a list of when each click occurred. Redirect URL interactions are also shown on the Insights form views for leads and contacts for those clicks that the system was able to associate with a lead or contact, which requires a cookie (as described earlier for website tracking).